Inder Loves Folk Art: Holiday Sewing 2017. Season's greetings, friends! 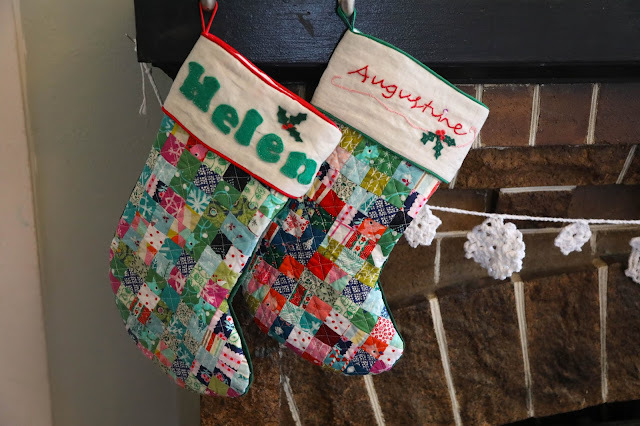 I am popping in to share a few items I sewed for the holidays. As usual, I had ridiculously ambitious plans for Christmas sewing, including gifts for the kids, decor items for my house, and gifts for many friends and loved ones. And as usual, I had to face reality and cut WAY back in the face of a very busy December. Sigh. So it goes! But I did manage to make a few very special items! First, stockings for my nieces. 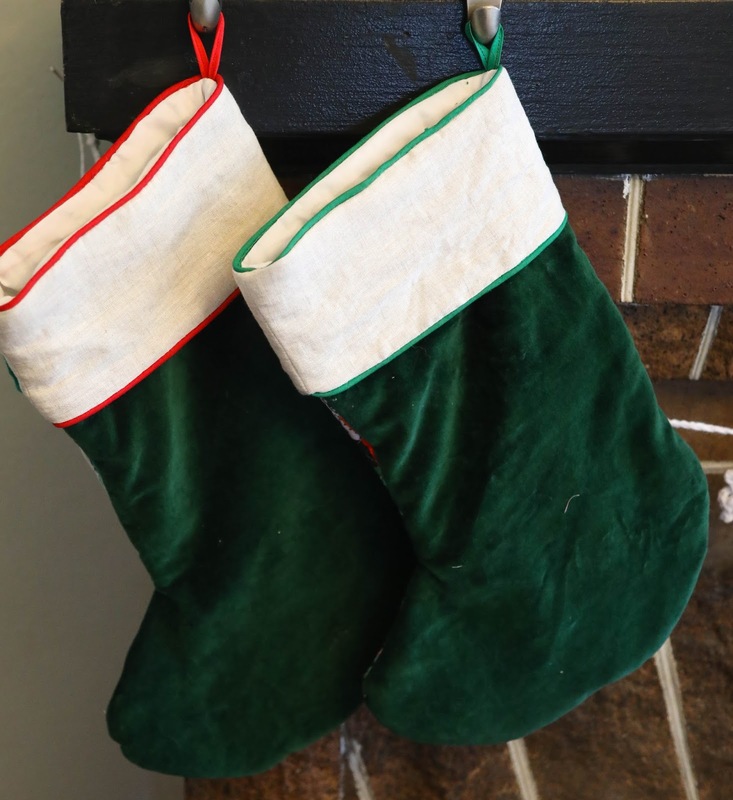 Full disclosure: I actually pieced these stockings last year! I didn't have time to finish the stockings and my nieces used purchased stockings last year. Rather than finish them up in the new year in the absence of any Christmas spirit, I put them away in my WIP bin and nearly forgot about them. 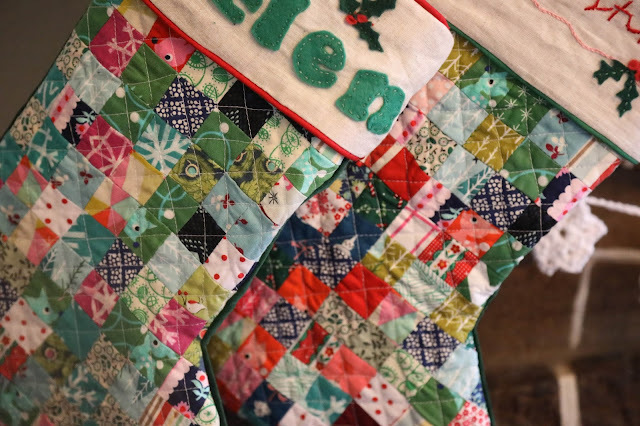 In November, my sister politely asked me if I might make my nieces "very simple, personalized" stockings, and I was like, "Um, I actually started them last year and just need to finish them!" No problem, right? I already did the hardest part when I pieced tiny postage stamp pieces (1" squares) from a variety of Christmas (and non-Christmas!) prints (mostly Cotton & Steel but there is a good amount of other stuff in there too) and quilted the stocking fronts last year. Well ... somehow these still took most of the season to complete! I spent the most time designing and embroidering the personalized cuffs. 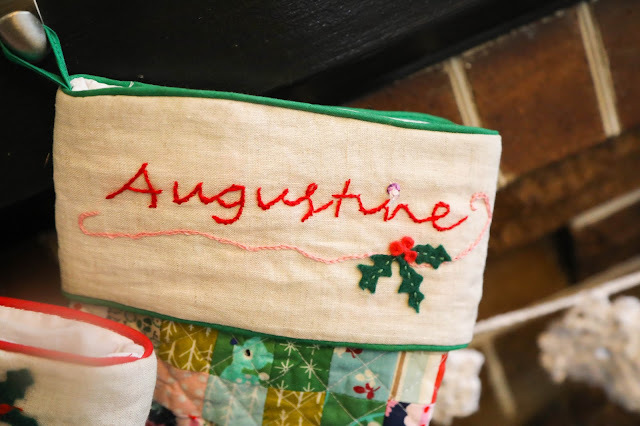 My niece Augustine usually goes by Gus or Gussie, but she told me she wanted her stocking to say "Augustine." Yes, ma'am. But that's a lot of embroidery! And at the end, Helen's more graphic cuff seemed to make Augustine's look weak with an excess of negative space. So I added a little more embroidery and the little felt holly and berries, with a matching garnish on Helen's cuff. Assembly took longer than expected too, with all the piping I did. I backed them in the softest, most luscious cotton velveteen from Stonemountain. The fine linen I used for the cuffs came from Britex. All in all, these were a labor of love that took more than a year to officially complete, although I probably spent less than a week of afternoons working on them total, it still felt like a serious effort! I am so pleased with how they turned out, though! So all that work was worth it. I love that they coordinate but don't match, reflecting the individual personalities of my sweet nieces. It is growth spurt city over here, and Joe has grown like three inches this past year. 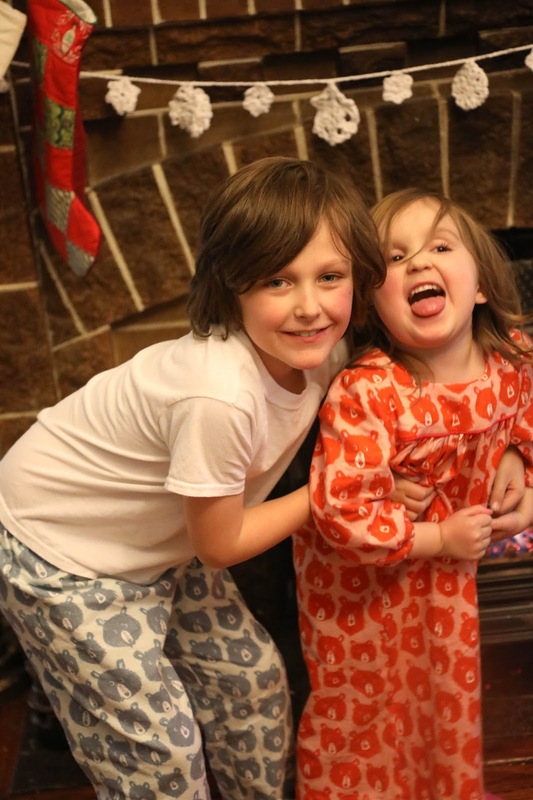 The pajama pants I made for him last year are too tight in the rise and too short, although he still wore them to school recently for pajama day. 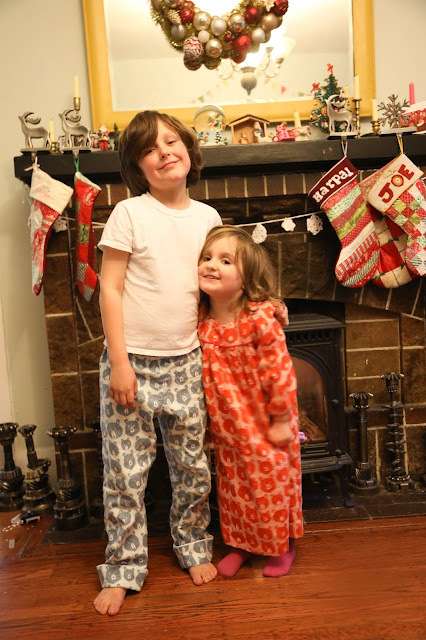 Joe often wears sweats to sleep in, but with pajama day being a thing at his school, I think he needs a couple pairs of decent dedicated PJ pants. I have a bunch of flannel so maybe I'll whip up a couple more pairs! Although you know your kid is really growing up when a pair of pajama pants requires every last bit of two yards of 45" wide fabric! Ay yai yai! He's practically a grown up! Once again, these are the Oliver + s Sleepover Pajama pants. Last year I made him size 6, reduced in length. This year, I made size 7, with all the length in tact and cuffs that can be folded down for extra length if needed later! I put a little bit of white piping on the cuffs for that old fashioned men's pajama look. They are roomy, but if this year is anything like the last, that will be a good thing! It's bittersweet seeing my kid shoot up like this, although on the bright side, he's willing to eat a lot more variety of foods these days! Hunger will do that to you, I guess! Who is that rude girl? LOL! This was not the easiest photo session, and this was, tongue notwithstanding, one of the better shots I got. Ah well! For Maggie's nightgown, I used vintage Simplicity 9968, the same pattern I used for her last year. Maggie has grown ... a bit ... in the past year, and last year's nightie, which was a size 2 with extra length in the sleeves and hem, is now short on her. So this year, I cut out size 3 and added a bit of extra length. I actually think I could have stuck with the size two and just added a ton of length to it, as this nightie is a bit wide in the neck in my opinion, but it works okay. So Maggie is so much smaller than her peers, we have been known to worry about her some! She's also a VERY picky eater, which contributes to our anxiety about her size, because it just doesn't seem like she eats very much. Now, both Steve and I were small as children and relatively late bloomers so we figured she was just a chip off the old block, but we still worried sometimes. We shared our concerns with her amazing pediatrician, who noted that she was bright eyed, energetic, intelligent, and clearly thriving, so she didn't think anything could be seriously amiss, but recommended her for some testing. She had her wrist x-rayed - apparently you can judge a child's development by the growth of the bones around their wrist. If a child's wrists are normal for their age but their stature is extremely small, that could signal an issue. But if the wrist bones are undeveloped, the child is probably just a late bloomer, and will continue to grow past the time when their peers stop. I'm sure I'm way oversimplifying this - isn't it fascinating? Anyway, Maggie's wrist indicates that her bones are like those of a three year old, two years behind her chronological age! Weirdly, this is good news and indicates that she will likely continue to grow for at least two years past the average age, and will likely be a late bloomer like her parents (both Steve and I grew into early college years, and despite our small stature as children, turned out pretty average height in the end). So yeah, size three! This pattern is dead simple, with a lined yoke, gathered long sleeves with elastic, and a gathered skirt. There is a keyhole neckline in the back, and I used a simple flat white button and made a thread chain for the back closure. I used a bit of red piping at the yoke this year, for a simple look that coordinates with Joe's PJs. This nightie also needs the better part of two yards with those sleeves, so it's a good thing I rounded up when I bought fabric for these! Gone are the days when I could make anything for Maggie with 1.5 yards. The fabric is, of course, Cotton & Steel brushed twill in "Teddy and the Bears" - Joe's wearing the blue colorway, and Maggie's nightie is pink. I love Cotton & Steel holiday fabrics! Well, truly, I love all their fabrics, but their take on Christmas is always fresh and interesting. 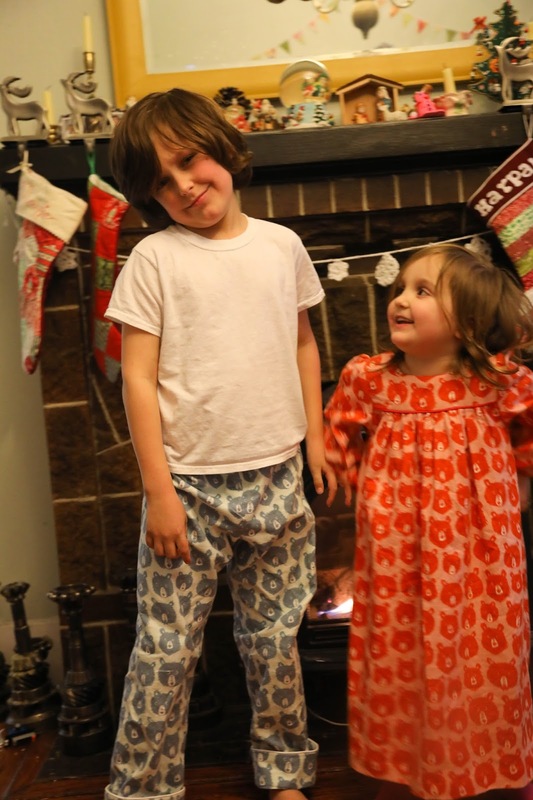 I love that these pajamas read just a little bit Christmas - they are actually quite subtle! Some smaller things I made (ornaments, a covered journal) can be found on my Instagram feed. And that's a wrap! Merry Christmas and Happy Boxing Day, friends! We had a wonderful Christmas here, and I have a new macro lens to try out on my camera! I am excited to turn to some selfish sewing in the new year. 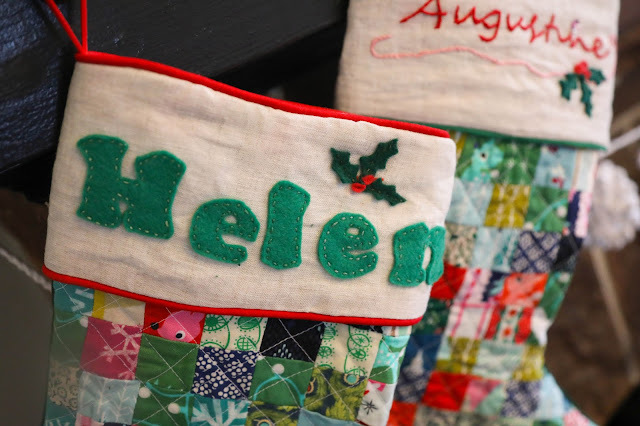 Did you manage any holiday sewing this year? Do you always bite off more than you can chew when it comes to holiday sewing plans? Those stockings are so beautiful. I bet you are so happy to have them done! That velveteen on the back looks divine. And the pjs are wonderful. I love the piping on Joe's cuffs - it makes the garment! It is a sad day indeed when you realize you need to up your standard fabric order ... and wonder what you're going to do with all the remaining 1-yard, or whatever, pieces in the stash. We're up to two yards as a standard order for the girls, and although I did just manage to sew G pants out of 1 yard of sweatshirting, I don't think I'll be able to do so much longer ..
Lovely work, as always! Happy 2018 -- here's to another great sewing year!